This new robot kit from Actobotics will spark creativity and imagination. It is fun, affordable, durable and snaps together quickly!. Use the “snap on” micro-controller mounts to attach an Arduino, Raspberry Pi, Redboard, or other board without hassle! This new collection of unique robot kits spark creativity and imagination. They are fun, affordable, durable and snap together quickly! They can easily be expanded with our continually growing Actobotics line. Whether you’re an experienced roboticist or new hobbyist, these are great for a variety of applications. Simply mount your electronics using our innovative multi-board mounts that are compatible with a variety of micro-controllers; such as Raspberry Pi, Arduino and the SparkFun Redboard. The Runt Rovers™ are perfect for beginning lite programming and educational applications. The Peewee kit is the smallest of the bunch weighing in at just under half a pound! There are no tools required to assemble this kit, it is entirely snap-together! Watch the video and the 3D diagram for assembly guidance. We know you’ll have a ton of fun with this kit! Please note: Wheels may be yellow or grey. The innovative “snap on” micro-controller mounts make it easy to attach an Arduino, Raspberry Pi, Redboard, or other board without hassle! 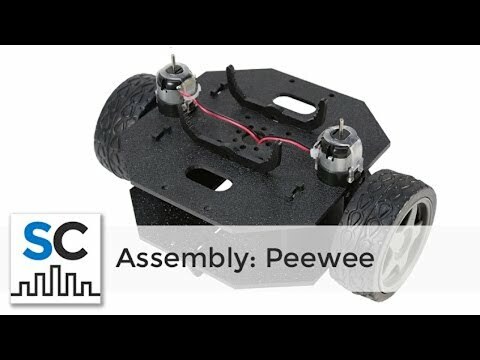 Two 140RPM pre-wired motors are included with the Peewee kit!